The vacuum switch is similar to a pcv system on a car. Two baffles on the valve cover vent into an air valve which routes it back into the air box. 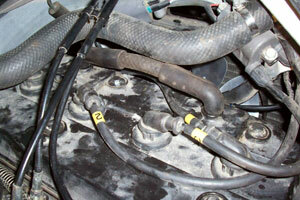 By looping the line, the exhaust gas and oily residue stays out of the air box, carb, and intake side of the engine. 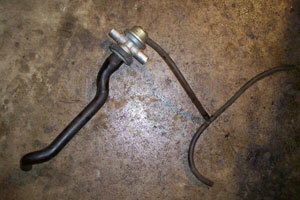 It also is supposed to reduce exhaust popping on deceleration. Factory Pro also recommended doing this with their jet kit. On the left you will see my simple and free valve bypass. On the right, you will see the valve that originally connected to the two vent hoses on the left. The long hose on the valve on the right goes back into the air box. The two vacuum lines on the valve activate the valve. I used vacuum caps to plug the barbs on the carb body where the vacuum line used to plug into.